Under a diligent property manager’s care, the value and appearance of real estate should not only be maintained, but also increase in value over time. Property managers oversee the performance of residential or income-producing commercial properties, and work to keep the buildings and land structurally and environmentally sound. Building maintenance and operations can be a challenging responsibility when attempting to locate the source of a problem. Infrared (IR) technology, however, can provide the answers to many building maintenance concerns, while saving property mangers time and money, and keeping tenants satisfied. washing machine on the third floor,which is completely hidden within the wall. Infrared thermographic inspection techniques are an accurate and non-invasive way to monitor and diagnose the condition of buildings. Infrared cameras quickly locate problems while their non-contact precision temperature measurement and analysis capabilities instantly deliver the answers you need to understand what repair action to take, and when. In other words, using an infrared camera allows you to "see" through walls, pipes, etc. as if having x-ray vision, because it measures the temperature of an object and displays a thermal image. FLIR Systems is the global leader in infrared cameras, providing an exceptional tool to investigate building maintenance issues - as infrared is able to pinpoint the root causes. There are many applications within the building diagnostics industry where infrared cameras are used including restoration, inspection, and energy auditing. To a property manager or an insurance company involved in a property damage settlement, clear images of normally invisible diagnostic evidence can be invaluable for planning the restoration effort and rationalizing settlements. For example, after a fire, an infrared camera can quickly locate remnant hot spots, and provide valuable data for insurance companies Cause and Origin investigations. The thermal images can also reveal if a fire has been completely extinguished and that no further hot spots exist that might reignite. For catastrophic storm water intrusion and plumbing failures, infrared cameras are able to trace the influx of moisture to find the origin of the incursion with little or no disassembly of the premises and minimal disturbance of inhabitants. During restoration, infrared thermography can be used to evaluate the progress of the drying out process. Having authoritative thermographic records can reduce or even eliminate the need for insurance companies to make on-site inspections, along with protecting against future frivolous claims. and building structure and on the floor by their relatively cooler temperatures. Infrared can also help win the battle against moisture and mold in building materials that can destroy structural integrity and cause serious health concerns. Infrared cameras distinguish between wet and dry materials by revealing the thermal characteristic of wet materials to store heat very well, and warm up or cool down more slowly than dry materials. Mold has become a growing concern for property managers due to the increasing number of claims stating that mold is a severe health hazard, causing respiratory problems. The first step in mold remediation is to accurately locate and remove all sources of moisture. Infrared cameras can instantly image entire rooms, inspecting places that can’t be physically reached with moisture meters, reveal wet conditions behind surfaces such as wallpaper which doesn’t readily water stain, track leaks to their source, monitor the drying process and confirm when a structure is in fact dry. Interior infrared survey conducted during daytime hours reveals central area of roof saturated with moisture and in need of immediate repair. When a problem calls for a building inspection to take place, an infrared camera is the most accurate tool to address the issue at hand. 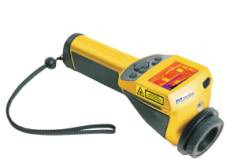 Infrared thermography can be used for inspection of electrical fuses and circuit breaker boxes, checking them for loose or corroded connections. Any time a circuit is running abnormally hot; it is using extra electricity and therefore costing more money. Plus, an overloaded or malfunctioning circuit is a potential fire hazard. By determining the exact location of a hot spot in electrical wiring, immediate corrective action can be undertaken, thereby saving money and preventing a fire. Note how thermography easily finds the problems in this circuit breaker panel. that run through walls and attics. Thermal image of double pane window versus single pane windows – clearly showing the difference in energy efficiency. Infrared inspection quickly identifies problem areas of buildings and homes that can't be seen by the naked eye, and eliminates more costly inspection techniques that require destructive investigation. An infrared camera enables reports of inspection results to be generated in seconds, so that the repairs can begin with maximum speed and assurance. By initiating an ongoing proactive IR maintenance program, property managers save time and money in their restoration, inspection and energy auditing efforts - with the added benefit of satisfied unit owners. "On behalf of the Newton Housing Authority and it's clients, I wish to express my sincere thanks for the prompt, courteous and professional service which you provided with respect to our recent fire and related water cleanup at our development in Newton Highlands." Puritan's service has always been highly professional, timely, extremely efficient and consistent in carrying forth our image. In a time of need, Puritan has been invaluable in mitigating Thanks again for being a valuable partner in our organization."